Bridge for Health (B4H) was originally founded in 2013 by Paola Ardiles (faculty member at Simon Fraser University) in Vancouver, to act as a local network to promote citizen engagement in health. B4H grew and attracted local and global members as it started to emerge as an incubator for social innovation, moving away from a medical model towards a community-based model focused on promoting wellbeing and equity. After three years the network evolved into a service-oriented social enterprise and incorporated as a cooperative association at the end of 2016. 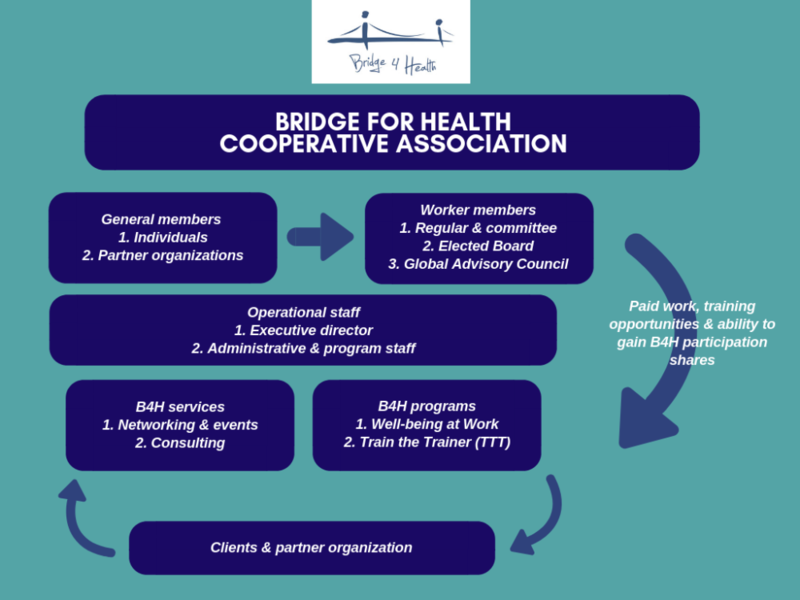 Bridge for Health Cooperative was co-founded by four women and now its members representing various disciplines, ages and visible minorities including immigrant, refugee and Indigenous women. After conducting an environmental scan, B4H concluded that workplaces are in need of social innovation, as work-related health problems are having significant economic costs in both the private and public sectors, and current solutions are not working. Hence, B4H created the Wellbeing @ Work Initiative, a training program that supports the development of new and creative workplace solutions, using participatory approaches that foster engagement of employees and leaders. In 2017, B4H was awarded the Coast Capital Savings Venture Connection-Social Impact Award for its Wellbeing @ Work Initiative.